Built as the Canadian corvette Norsyd. Manned by American volunteers. First group of refugees were members of Jewish organizations and wives of servicemen who sailed from Sète, France, and were transferred at sea west of Crete by motor launch, 30 persons at a time to Biriah (No. 119). A new party of 2678 was picked up at Bakar, Yugoslavia. This was the largest group yet, including 150 children under 10 and 150 expectant mothers. Ship was found at sea with engines broken down with no electricity. 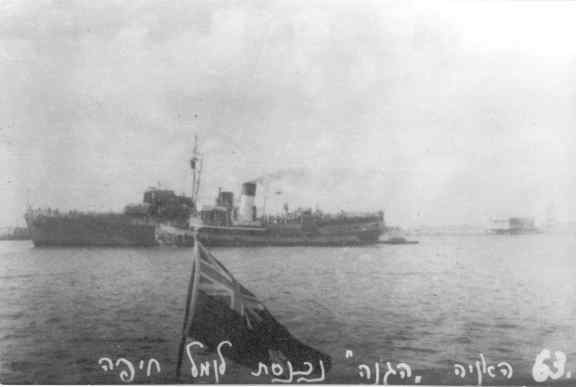 Taken in tow to Haifa by British destroyer Venus. Served in Israeli Navy until 1955 as Haganah. Name: The Haganah was the Jewish Defense Force which later became the Israeli Army.